Other Comments Off on The geography of the Maya: does central place theory apply to ancient Maya settlements? Where is the geographic center of Mexico? 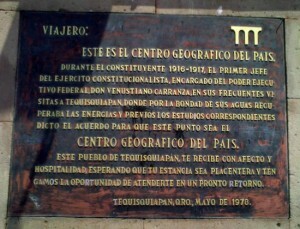 Well, believe it or not, Mexico has more than one geographic center. This is why, whenever I’ve been asked this question in the past, I’ve always deliberately fudged my reply. So, there is definitely more than one answer to the original question, “Where’s the center of Mexico?” Let’s take a look at some of the contenders. 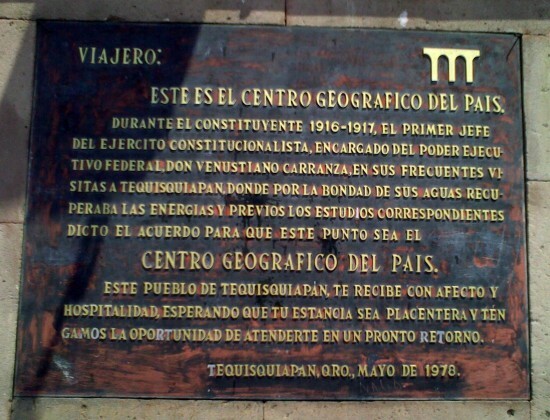 The townsfolk of Tequisquiapan, a spa town in the state of Querétaro, laid early claim to the idea that their town is the center, erecting a monument to that effect with a plaque that clearly states “this is the geographic center of Mexico”. Hmm… unfortunately, I’ve absolutely no idea why this position could count as the center! I’ve often been told by well-educated Mexicans that the true center is actually a point in Guanajuato state, very close to (or corresponding precisely with- opinions differ) the Cerro del Cubilete, the prominent steep-sided hill that rises above the interior plains between the cities of Silao and Guanajuato. I’ve never been clear on what basis this point qualifies for the “geographic center sweepstakes”, but the hill certainly does boast a huge religious statue on its top, and is a regular destination for thousands of pilgrims. Another alternative is offered by the government mapping and statistics organization, INEGI. Maps displayed when the option “Centro geográfico” is selected on one of its web-pages show that a point in Zacatecas is likely to be the center of mass of the country, with the precise location depending on whether only mainland points are used in the calculation, or whether islands are also included. Strictly speaking, the INEGI calculation is based on averaging the furthermost points of Mexico in the four cardinal directions, rather than on a true “center of mass” calculation or demonstration. The true center of mass has been calculated, according to a brief text by Homero Adame Martínez in Mexico Desconocido (January 2000), to be yet another point in Zacatecas, just south of the village of Cañitas de Felipe Pescador. Most conveniently for all railroad lovers, this point is very close to where the tracks of two major railroads (from Mexico City to Saltillo and Ciudad Juarez respectively) cross. Well, having explored the issue of “Where’s the geographic center of Mexico?”, let’s end with a related but much simpler to answer question: “What’s on the opposite side of the globe to Mexico?” This is the point where you would eventually emerge if you were able to dig an unbelievably deep hole straight through the center (core) of the earth. If you began digging outside the National Palace in Mexico City, you’d emerge… in the middle of the Indian Ocean, relatively close to the tiny Cocos (Keeling) Islands.